While each and every Seder is unique in its own way we hope that this Seder will challenge and expand the relevance of the story of the exodus. Our Seder leaders will help us understand ancient teachings in a contemporary and meaningful way. Adding to the experience will be traditional songs as well as the songs of Rabbi Shlomo Carlebach during the course of the Seder. The Hagaddah will be read in Hebrew and in English. While having a strong background in Judaism will enhance your experience at the Seder, even those with little or no background will be able to understand, participate, and get the experience of the Seder. 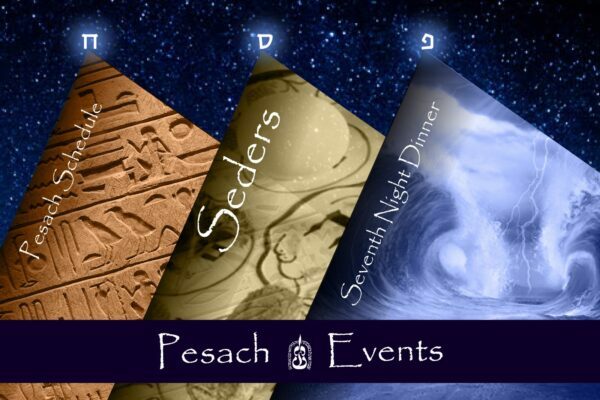 Pesach Schedule Thursday, April 18th – B’DIKAT CHOMETZ Search for Chometz 8:21 PM Friday, April 19th – EREV PESACH (Fast of the First Born) Chometz not eaten after 10:40 AM Chometz burned 11:48 AM Candle lighting 7:21 PM Mincha/Yom Tov Services 7:10 PM Begin the Seder at 8:20 PM We are no longer taking reservations for the first Seder. Saturday, April 20th – 1st DAY PESACH Morning Service 10:00 AM Mincha /Yom Tov Services 7:15 PM Candle lighting no earlier than 8:24 PM Begin Counting the Omer (p.312, Artscroll Sfard) We are no longer taking reservations for the second Seder. Sunday, April 21st – 2nd DAY PESACH Morning Services 10:00 AM Mincha 7:25 PM Yom Tov ends 8:25 PM Thursday, April 25th – EREV 7th DAY of PESACH Eruv Tavshillin Candle lighting 7:27 PM Mincha/Yom Tov Services* 7:30 PM Friday, April 26th – 7th DAY of PESACH Morning Services* 9:00 AM Candle lighting 7:28 PM Mincha/Yom Tov Services* 7:30 PM Saturday, April 27th – 8th DAY of PESACH Morning Services* 9:00 AM Yiskor Approx. 11:30 AM ●●Mincha/Moshiach Meal 6:00 PM Holiday Ends 8:32 PM Chometz can be eaten after 10:30 PM *Oneg Shemesh will be leading services for the last days of Yom Tov. While each and every Seder is unique in its own way we hope that this Seder will challenge and expand the relevance of the story of the exodus. Our Seder leaders will help us understand ancient teachings in a contemporary and meaningful way. Adding to the experience will be traditional songs as well as the songs of Rabbi Shlomo Carlebach during the course of the Seder. The Hagaddah will be read in Hebrew and in English. While having a strong background in Judaism will enhance your experience at the Seder, even those with little or no background will be able to understand, participate, and get the experience of the Seder. We are no longer taking reservations for the first Seder. We are no longer taking reservations for the second Seder. *Oneg Shemesh will be leading services for the last days of Yom Tov.